MFA, who was featured in Third Coast, New Letters, Puerto del Sol, and Southeast Review, among others. 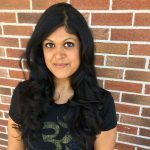 Ms. Patel’s honors include the Harriet Collins Jaycox Prize, a Kundiman fellowship, and multiple Pushcart Prize nominations. She is also a coach and consultant in the US and Canada. I love the art of writing, but to me, writers themselves are even more exciting subjects of exploration. Writers have the potential to make an impact, express the unspeakable, and bring meaning to the world. I find that the positive unfoldment of a writer’s life is often parallel to the unfoldment of their best writing and peak successes. This is why I like to see writers become skillful in their lifestyle, not just hard working in the realm of their art. My passion is human transformation. My teachings shift perspective to encourage individual writers to evolve into better, more powerful versions of themselves. Beyond the art of writing is the art of self; writers who are ready for improved creativity, enjoyment, productivity, and success would benefit from our work together.